I think it is always important to use your gifts to their fullest. In my free time I teach Confirmation to Catholic Youth. I needed to make a gift for my small group, 5 young men who have put up with me this last year. As I thought about what to give them, I realized that the best thing would be something I’ve discussed with them all year… my travel rosary project. Now this came about from necessity. I travel frequently for work, and I always take my rosary with me. The problem is I always keep it in my bag, which sometimes I put into overheads on planes. I try not to keep it in my pocket because it has a tendency to get left / lost there. I have had traditional travel rosaries in the past, but I lose those faster than I can remember where I put them. It seemed that the one thing I never seemed to lose was my wallet (often). 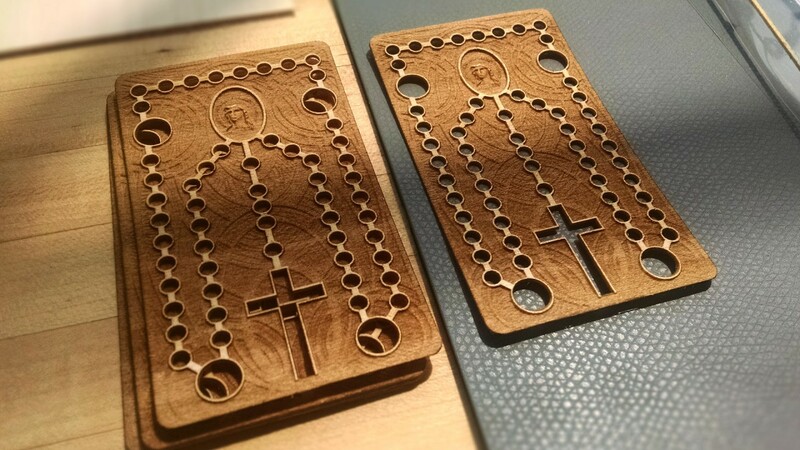 So I did a quick travel rosary out of chip board. Well, the cardboard tore quickly, and I made the holes too large so it fell apart. 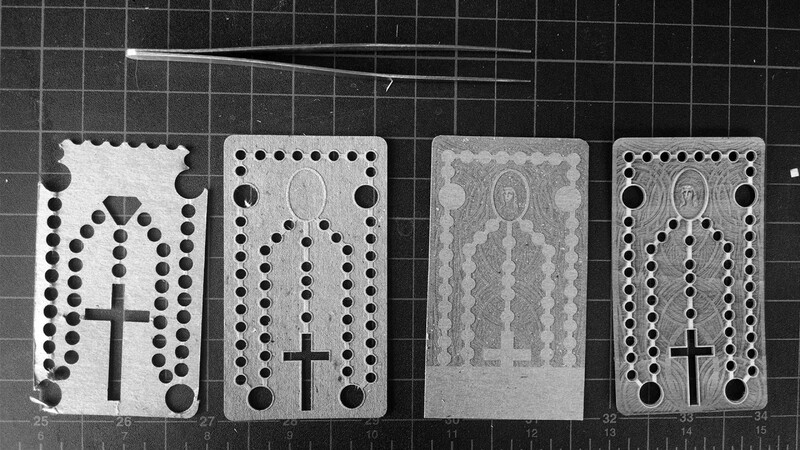 Showing the progress from the first idea, to the final laser cut. Even so, I still found myself using it more frequently than a traditional travel rosary. So I changed the hole spacing and tried again. This one did better. But I still felt putting a backing to it would allow for maximum stability. Then I saw a colleague use the laser cutter to make some beautiful etchings into a wood box. That’s when I realized I had to think 3D. 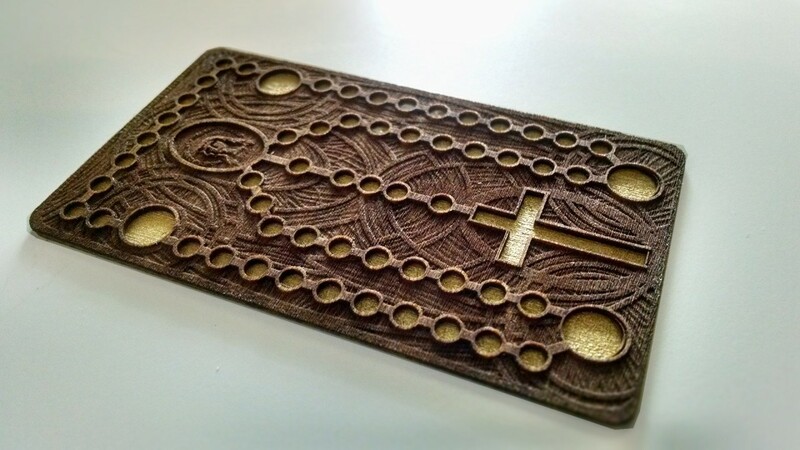 So I made a pattern, somewhat inspired by Art Deco, and placed it as an underlay beneath the rosary. Then I found an image of St. Mary from our Cathedral and adjusted it so that it would act in relief (worked fairly well, but needs some adjustments on the next go around). The final result is from two laser cut bass wood pieces, stained, with a layer of metallic paint between layers. Next I am going to see if I can’t celebrate the original translucent quality, while still keeping the durability.